This video shows how the Faith of Christ was carried by the early Christian missionaries from Palestine to the far West in the first half of the first century A. D. and its resulting impact upon the Celtic communities of the Britannic Isles. After the departure of the Roman occupying forces in 410 A.D. the rising stars of the saints: Ninian Columba Finian and many others brought the light of Christianity even to the Picts of the far North of Scotland. Through their teachings the Faith spread Southwards from the monasteries of Iona and Whithorn into Northumbria centered at Lindisfarne or Holy Island reaching as far South as the Channel coast land. Centuries later seeking freedom of worship the Pilgrim Fathers took the faith across the Atlantic Ocean into the wilderness of the New World planting a code of Christian conduct based solely on the Word of Holy Scripture. Shown are the holy sites of the monasteries of Iona Whithorn and Lindisfarne (or Holy Island) Christian sites which spread the Gospel of the Kingdom. 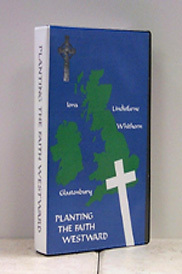 ...Standard VHS....ALSO Available on PAL (VHS) for our European customers....please add the letters "PAL" in the comment box when ordering for this special VHS tape.